Object for Reflection is large-scale sculpture that responds specifically to the changing light of the sun. Comprised of thousands of tiny aluminum pieces hand folded around stainless steel rings, Object for Reflection appears at times solid and opaque or translucent depending upon the time of day. Available light acts upon the aluminum circles like pixels on a screen, in constant but subtle motion, underscoring the mutability of the light itself. The colors of night become apparent: darkness is not simply black, but rather a spectrum of black: inky darkness, silvery moonlight, deep blue. 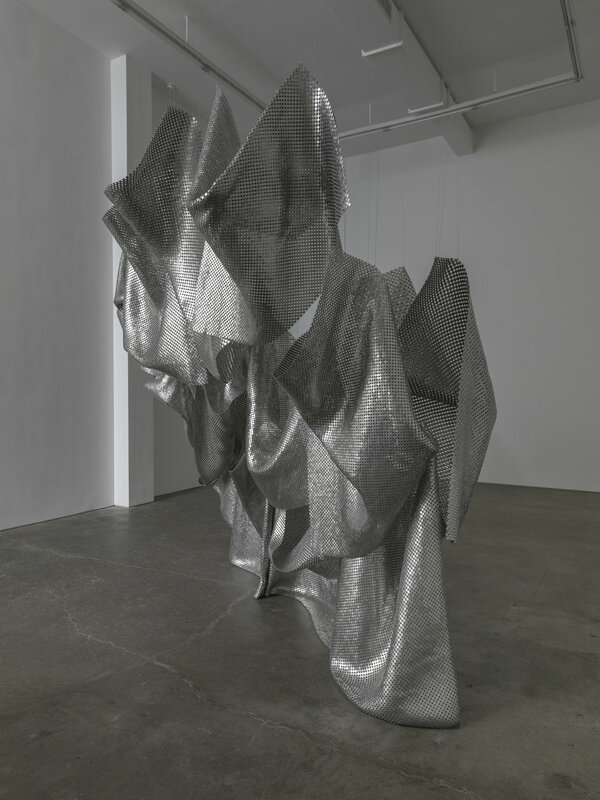 Based in the tradition of monumental metal sculpture by artists such as Serra or Di Suvero, Object for Reflection re-imagines the notion of what a large-scale metal sculpture should look like: instead of being a solid heavy welded object, it is comprised of many parts entwined together- flexible, sagging, responsive to light. Originally two dimensional, the sculpture is made up of connecting geometric planes; these planes become three dimensional as they respond to gravity, space, tension, weight and materiality.